I originally wrote this up to assist a fellow XKer in adjusting the SU's on his Jag.. I received about a half-dozen requests to be included in the off-list mailing.. Please note.. the below set of instructions is a combination of my words and paragraphs from the XK 120 Service Manual.. the "factory" wrote somethings in a more clear, concise and understandable manner than I could.. There will be those who disagree with this method of Carb adjusting and I will agree.. this is NOT the only way to adjust SU Carbs as I have used different methods of adjusting on other English cars and Swedish cars fitted with SU's or cars with the Japanese version SUs (even a Harley fitted with an SU from an MG). The method listed below seems to work best for dual carb XK's that I have worked on.. It IS NOT cast in stone. These "instructions" for adjusting the SU's assumes that you have inspected the throttle shafts and their bores in the carb body and they are NOT worn out and sucking air.. this can lean out an engine and cause burned valves! I have also made a few additions and changes to clarify a few areas. The first thing that needs to be done is to insure a proper ignition system. Clean and re-gap the spark plugs.. I like .025". Check the points for pits, burnish lightly if necessary and re-set to .016"
Check "Static" timing to "book specs" for your engine. Insure that the valve clearances are to specs as is compression..
Any weakness in the above areas will affect the adjusting of the SU Carbs.. Remove the air cleaners, remove the screw-in dampers from the top of the dash-pots.. reach a finger into the intake of the carb and lift a half inch or so and drop.. does the dash-pot drop swiftly and with a solid "klunk"?? If so, good. Now raise dash-pot piston fully and allow to drop to the bottom against your finger.. There should be no binding at all.... double check to insure the dash-pot is "bottomed" in the venturi.. if there is any binding, your main jet could be off-center or the needle jet could be bent and rubbing/binding in the main jet.. If the main-jet needs centering, you will need the "SU Tool Kit".. this kit has a jet adjusting wrench (that generally doesn't fit the XK's), the edge of the handle of said wrench is also used as the "straight-edge" that one uses to insure the needles are seated to the proper depth in the dash-pot pistons. The "shoulder" of the needle boss is flush with the base of the piston. This is a "MUST." There are two aluminum tubes in the SU tool kit, one round and one oval.. the "ends" of each tube is used as a gauge for the float height adjustment, depending on the size of the carbs.. unfortunately this kit does not include a half inch size as that is the float level for the SU's on the XK's.. A 1/2" drill bit works fine.. these tubes have a smaller diameter end that fit down into the hole of the dash-pot pistons and the two wires in the kit fit into the tops of the tubes.. this is how one adjusts the joining linkage between the two SU carbs to insure they open at the same time.. The last bit in this kit is the main-jet centering tool.. it's a little bitty thing that fits into the hole where the needle fits in the base of the dash-pot piston and is used to center the main-jet if a complete disassembly is done.. on some H & HD SU carbs, this can be done without disassembling the carbs.. Remove the cap nut (if you still have them) at the base of the jet and rotate the jet adjusting screw upwards (clockwise, as looking from the bottom) as far as it will go to position jet at it's highest point. 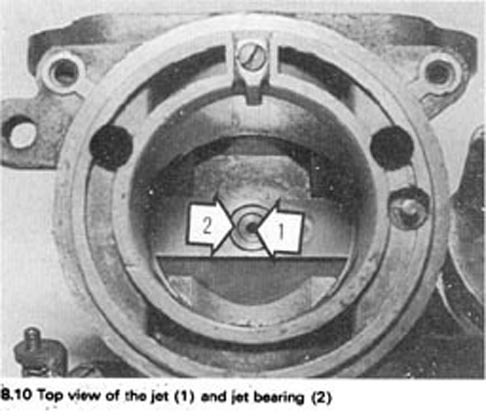 Ensure that the jet parts are assembled in the correct position and release the jet securing nut. (you will need a factory service manual and a factory parts book for your XK's SU's to identify the order of the parts). 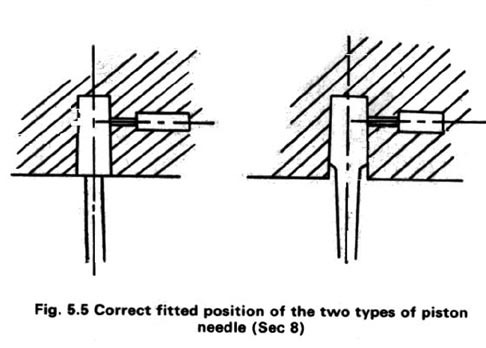 Fit the dashpot and piston with needle correctly fitted (see above). Unscrew cap and remove the hydraulic piston damper (if re-installed from above). Carefully raise and lower the piston to centralize the jet with the jet needle and finally gently tighten the securing nut. 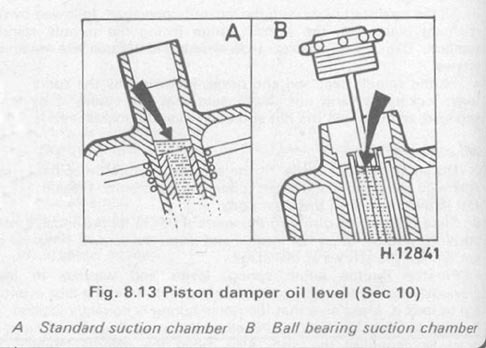 It may be necessary to slacken the jet securing nut several times before the piston falls perfectly freely. When the jet has been centered correctly bring the jet adjusting screw back to it's original position and re-install the hydraulic piston damper.. insure the damper hole has a couple of squirts of oil in the pistons.. don't over fill..
Now to synchronize the SU Carbs..
Have your "Uni-Syn" type carb synchronizing tool handy.. There are only two adjustments on the SU's.. the throttle adjusting screws which adjust the idle speed and the jet adjusting screw (at the bottom under the carb body) which adjusts the fuel mixture..
Start and run the engine until operating temp is obtained..
Place uni-syn tool over the mouth of one carb.. adjust the "venturi" of the tool until the red "bubble" is "floating" at or near one of the three lines on the sight-glass.. this isn't critical, just a rough adjustment.. the sight-glass should be perpendicular to level ground (pointing straight up).. remove and place uni-syn over mouth of second carb.. 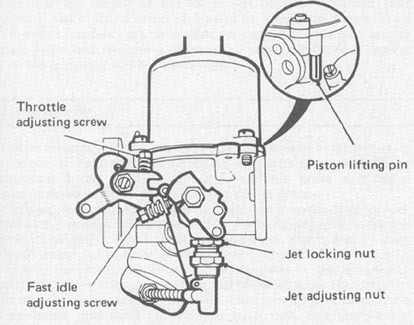 If the "red bubble" is NOT in the same location in the sight glass, adjust the idle screws of each carb to bring bubble to read the same on both carbs.. hint: Lower the higher one (turn out idle screw) and raise the lower one (turn in idle screw).. You may have to re-adjust the tool's "venturi" adjustment to get the bubble high or low enough.. this is normal. Now, using the aluminum tubes in the "SU Tool Kit", remove the hydraulic dampers and replace with the tubes.. fit wires to tubes and point toward each other.. you may have to bend (tweak) the wires slightly so they are both exactly even.. once that's achieved, using the throttle bellcrank linkage, raise idle slowly.. both pistons should rise evenly, equally and at the exact same time.. if one takes off before the other, than the carb linkage between the two SU's is not adjusted correctly.. adjust connecting linkage so both carbs "accelerate" at exactly the same time and exactly evenly.. When finished, replace the hydraulic dampers into the pistons..
Recheck the idle adjustment with the Uni-Syn and Tach meter.. if equal and to specs, now we tackle the mixture.. here is where it gets ticklish..
Start with one of the carbs, adjust the jet adjusting screw "IN" slowly, until you reach the top (don't over tighten).. then back out two and one-half turns.. do the other carb.. Using the "piston lifting pins", raise piston on FRONT carb..
(A) If the engine speed increases and the engine continues to run at that increased speed, the mixture on the REAR carb is too rich.. screw in a bit at a time. NOTE: I blip the throttles to clear the engine and re-test after every adjustment change.. it seems to help the adjustment go smoother and quicker for me. (B) If the engine speed increases then the engine falters and dies,this indicates a lean mixture in the REAR carb..
(C) When the engine speed increases momentarily and then decreases but the engine continues to run, albeit somewhat bumpy, then the mixture of the REAR carb is correct..
Now adjust the FRONT Carb using the Piston Lifting Pin on the REAR carb.. The above is the part that screws everybody up.. they can't get a handle on fiddling with one carb while adjusting the other..
Once both carbs have been adjusted, you may have to raise or lower the idle a touch and you may have to "re-balance" the carbs with the idle screws.. You may also have to raise the idle a touch after re-installing the air cleaners.. Always remember.. richer is better than leaner.. as spark plugs are cheaper than pistons! Too rich, too high an idle or incorrect timing can result in the engine "dieseling" when you shut it off. Also, adjusting the SU carbs is a "feel" type of thing.. it isn't cast in stone.. you will probably have to adjust the carbs several times before you get it exact.. it's a learning process.. once you develop the "ear" and the "feel", it becomes very easy..